The instrument was developed by B.R Research & Development Division Derby. Its use is to check the electrical integrity of the O.H.E structure to rail bonds. Some such bonds that may appear to be physically sound are in reality electrically open circuit, it is therefore most important that all bonds are electrically checked as part of the Overall Track Maintenance program. The instrument is simple to use, reliable in operation and robust enough to withstand track usage. The instrument is housed in a Tufnel box, on which is mounted the push-totest button, the L.C.D. display and a spring loaded impact probe. The latter ensures a good contact through paint or rust film on the structures. The electronics and display are only energised while the push-to-test button is pressed, ensuring good battery life. 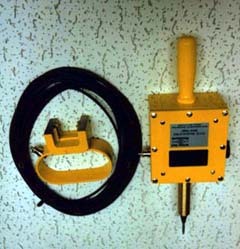 A magnet probe is connected to the box by a 10 meter length of 2.5mmsq. double insulated flexible cable. The instrument, test cable and magnet are supplied in a rugged carrying case. Preliminary check (this should be carried out before and after the instrument is used). Without the magnet and lead assembly fitted, use a small metal bar to apply an electrical short circuit between the probe and the terminal to which the magnet and lead assembly are normally attached. Press the button, the instrument should show a fleeting FAIL indication and then hold steady on PASS, continue to press the button and remove the short circuiting metal bar, the instrument should immediately show FAIL. Next connect the lead and magnet assembly to the instrument and check the continuity of the magnet and lead. The button is then pressed with the magnet clear of the impact probe, the display button is then pressed with the magnet clear of the impact probe, the display should indicate FAIL. The magnet is then brought into contact with the impact probe and the button pressed again; the display should indicate PASS. This sequence confirms there is no serious malfunction. If the instrument does not operate correctly it will require recalibrating.